JETCOAT Fibered Emulsion Roof and Foundation Coating is a homogeneous blend of asphalts, mineral stabilizers, water and fibrous reinforcement.This coating will provide a UV and water resistant barrier over metal, concrete, masonry and composition surfaces. When coating roofs, nail down any loose laps or parts. Repair splits, cracks, weak or leaking areas with JETCOAT All-Weather Roof Patch and Resin Treated Multi-Purpose Reinforcing Fabric, adhering to the directions on the container. Brush or broom away all dust, dirt, loose gravel or debris. Remove grease or oil with a detergent and water making sure to thoroughly rinse. Broom away any standing water. STIR BEFORE AND DURING USE. Coat the entire surface using a brush or roller. Best results are obtained if two coats are applied with the second coat applied perpendicular to the first. Allow a minimum of 36 hours between coats. Foundation walls should be thoroughly broomed and rinsed with clean water, ensuring the removal of dirt, dust and loose concrete particles. 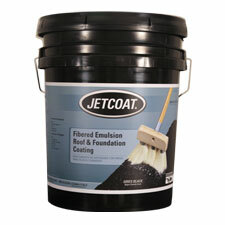 Apply JETCOAT Fibered Emulsion Roof and Foundation Coating with a brush or roller.To reinforce cracks, sandwich a layer of JETCOAT Resin Treated Multi-Purpose Reinforcing Fabric between subsequent coats. Allow a minimum of 36 hours curing prior to backfilling. Do not apply if heavy dew or rain is imminent within 24 hours of application. Do not apply if temperatures are expected to fall below 50ºF within 24 hours of application. Extremely chalking or rust scaled surfaces will require a primer. When wet, clean tools with water. If cured use a waterless hand cleaner. CALIFORNIA PROPOSITION 65 CHEMICAL WARNING: This product contains chemicals known to the state of California to cause birth or developmental defects. Provide a UV and water resistant barrier over metal, concrete, masonry and composition surfaces. 60715 4.75 gal. Pail 46 lbs. 60711 .9 gal. Can 9 lbs.